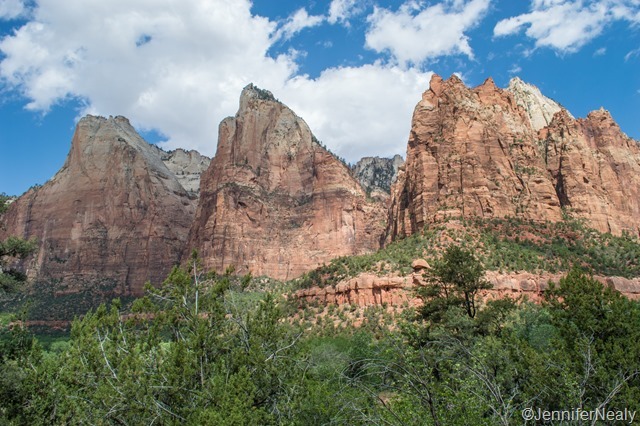 I made only two advance reservations for this trip – and one of them was for Zion National Park. 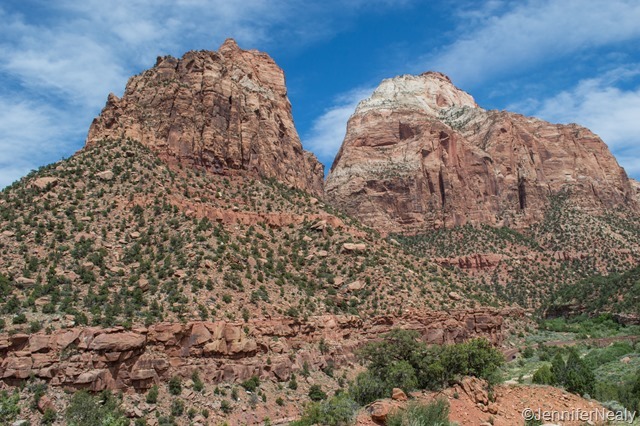 I hate making reservations too far in advance, but we heard that Zion was so popular that it was highly recommended to do so. We had a short drive over from Kodachrome, and arrived at the park around 11:00. 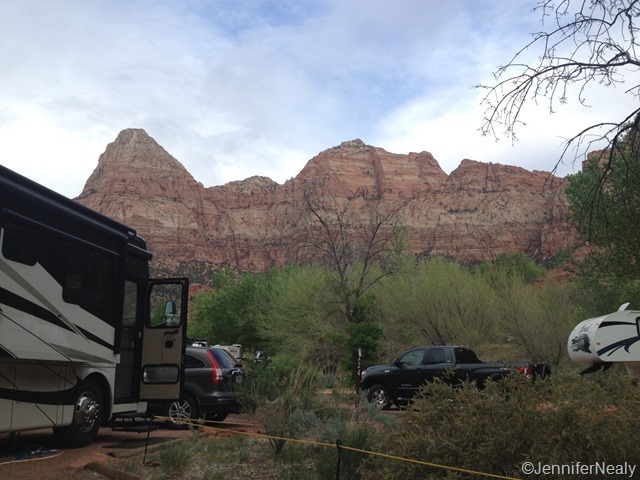 Much to our surprise, there was already a very long line of cars and RVs waiting to get into the park. We had to wait about 30 minutes just to get through the gate, and became very grateful that we knew we had a spot waiting for us in the Watchman campground. 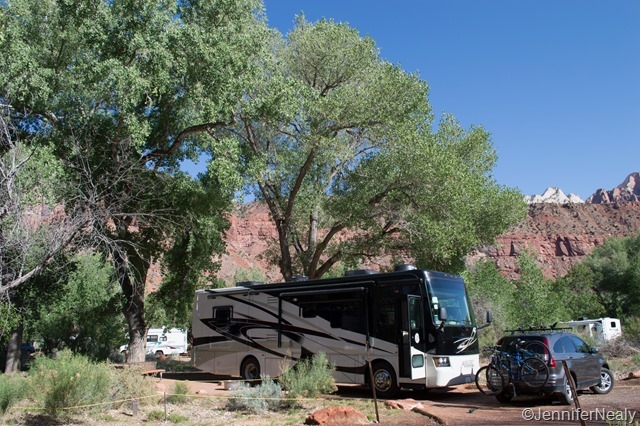 We had a great site – lots of room, a great view, and a lovely tree to give us some shade. However we noticed something odd about our site…we kept seeing people standing right in front of it, seemingly looking at the top of our RV with binoculars. One day we came back from our walk to find a group of 20 people, all looking over our RV with binoculars. Turns out there was a hawk’s next in the tree right behind our RV! Unfortunately the mother hawk had not been seen in several days, and no activity seemed to be happening in the nest. That didn’t stop people from showing up every day though. 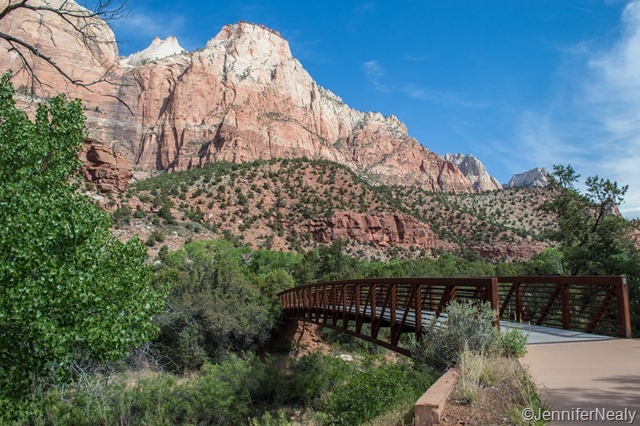 One of this nice things about Zion (for dog-owners) is that there is a 3-mile hike that dogs are allowed on. It’s a nice paved path that you can walk to right from the campground, so of course this was the first hike we did. 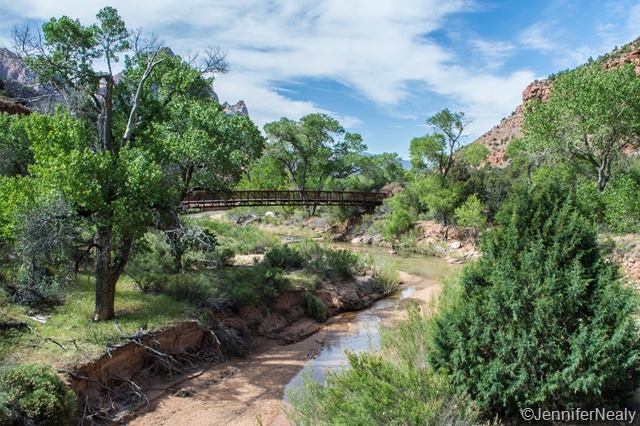 It runs right alongside the Virgin River and has stunning views throughout. That afternoon we took a drive over to the east side of the park, which is the only part you can access in your own car – you have to take a shuttle to go up into the north side of the park. The drive goes through a mile-long tunnel that is only slightly over 13 feet tall. If an RV does go through the tunnel, the park has to shut down traffic to allow the RV to drive right down the middle of the highway. We elected not to do this, but I could not believe how many RVs we saw that chose to do this. Maybe they didn’t know in advance, or maybe they’re just more adventurous than Deas and I are! The tunnel does have a few “windows” cut into the side of the rock, which were used to throw rocks out of when the tunnel was under construction. You can see one of these windows in the picture below. The views on this side of the park are just as equally breathtaking. The next day we decided to ride the shuttle into the north side of the park. We took the dogs for a nice long walk to tire them out, and then left them in the RV. We got off the shuttle on one of the first stops for a nice view of the mountains referred to as the Court of the Patriarchs. While we were at the viewpoint for the Patriarchs, we struck up a conversation with another couple. We ended up talking to them for about 20 minutes, and just as I was about to suggest that we move on, my cell phone rang. I looked at the phone and saw an Idaho area code. Unfortunately, I knew exactly what this meant, and I knew it wasn’t good. It was another RVer calling from the campground, and it was about one of our dogs. You see, we had an issue once before where Jake managed to push his way out of a screen window and run around a campground for an hour before he was wrangled up by another camper. Because of this I have a sign on our RV with our phone number on it whenever we leave the dogs unattended. And we also leave the windows cracked just a little bit, to prevent another escape attempt – or so we thought. Jake had managed to somehow turn the passenger swivel chair just enough so that he got access to the one window that was large enough for him to push through. Fortunately, the couple in the RV next to us happened to look over just in time to see Jake halfway hanging out the window. They very kindly rushed over to start yelling at him, and then called us. We immediately hopped back on the shuttle, but of course we got the slowest shuttle driver in the whole park and it took us a good 20-25 minutes to get back to the campground. The couple that called was still standing outside the RV when we got there, and they were holding some sort of pole that they would use to tap Jake on the nose whenever he tried to push himself out again. Seriously, what is wrong with this dog?? We thanked them profusely and ran inside the RV to find a nearly hysterical Jake and a very calm Nikki and Shorty. I don’t know what Jake’s issue is, but he HATES to be inside. He wants to be outside all day – he would probably sleep outside if we let him. Even at our house he insists on spending all of his time on the porch or in the backyard. Deas was beside himself with frustration. In an effort to try and wear Jake out, we took them all on another walk, and then Deas rode the bike for about 20 minutes with Jake running along beside him. Deas went ahead back to the shuttle and I stayed behind for a little while to see if Jake would settle down. After another 30 minutes, he was still pacing, so I took drastic measures and drugged him with benadryl! I felt bad about doing it, but I had to get him to calm down. I don’t know what we’re going to do about him. After Jake finally settled down, I took the shuttle to meet up with Deas. 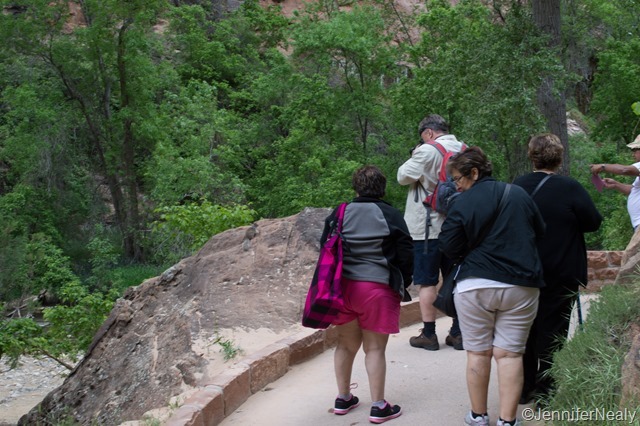 We had planned to do a few hikes, but at this point I was anxious about what other mischief might arise back at the RV, so we just rode the shuttle the whole way and looked at all the sites. 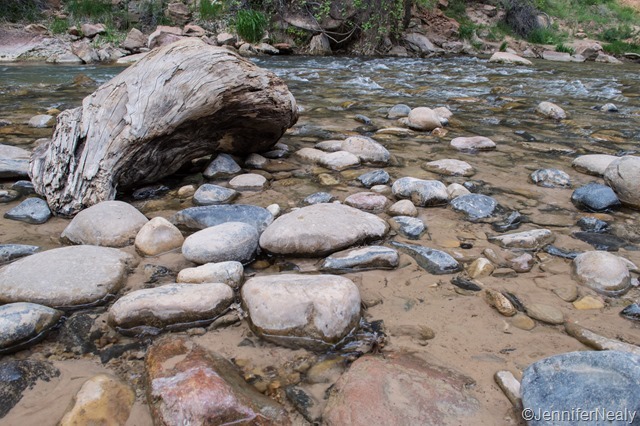 We did decide to take the trail that leads to the Narrows, the hike that takes you right through the Virgin River. 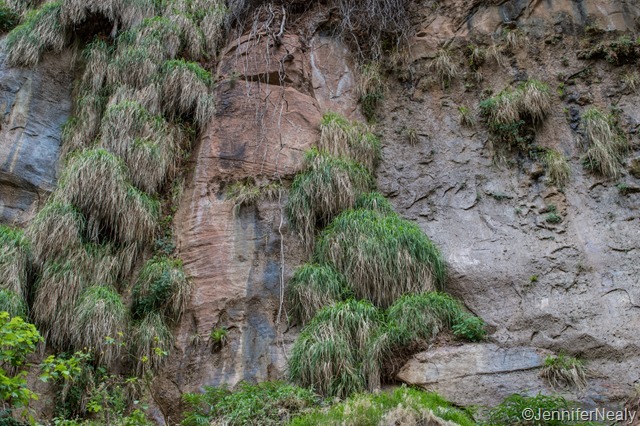 The part of the hike that leads to the river is paved and very easy, and runs right alongside the river itself. 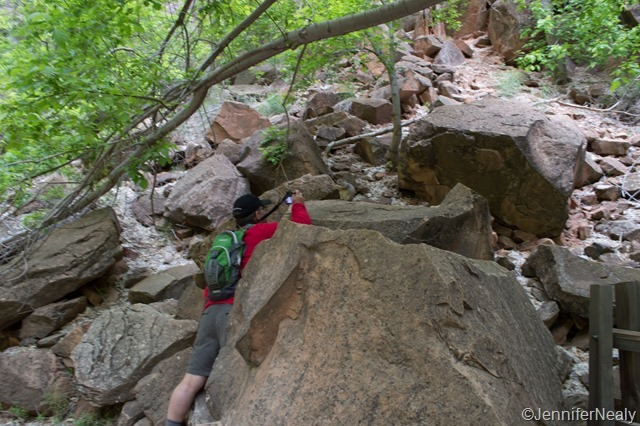 One of the things that cracks me up when we’re in national parks is the number of people that I see taking pictures of rodents…squirrels, chipmunks, etc. Don’t these people have squirrels at home? Oh my goodness! Jakey is just not a National Park kind of dog, is he! 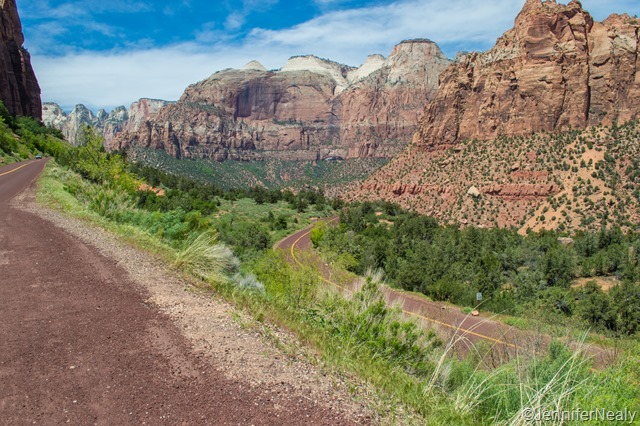 I hope you don’t have too many more Nat’l parks during the rest of your trip! Good thing you were able to get back to the rig pretty quickly…and that you had your number available! Sometimes I think he’s just not an RV kind of dog! He’s been outside all day – we just made him come in and he’s pacing around nervously. Maybe he’s claustrophobic?! Oh Jake! I am trying not the laugh because I’m sure this is stressful for you, but the image of him hanging out the window while the neighbors poked him with a pole to prevent him from jumping out is pretty humorous. 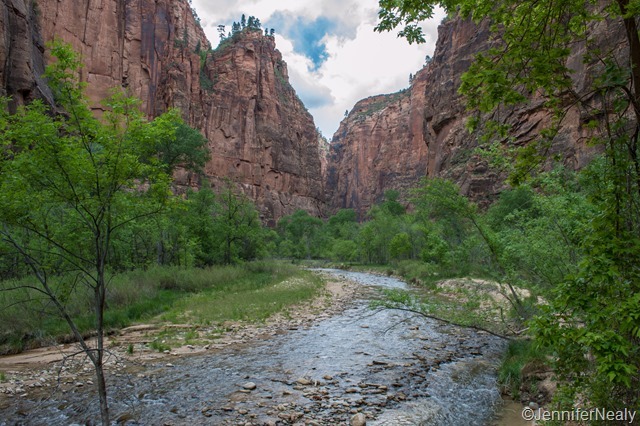 At least it sounds like you got to enjoy a little bit of Zion. And I am with you on the squirrel photo thing! What is wrong with people? It was stressful while we were rushing back, but yes in hindsight it is pretty funny! I just couldn’t believe those people were nice enough to stand there the whole time making sure Jake didn’t get out – thank goodness for them! That’s too bad but what a clever dog:) There you are in such an amazing place and Jake wants to go along!! 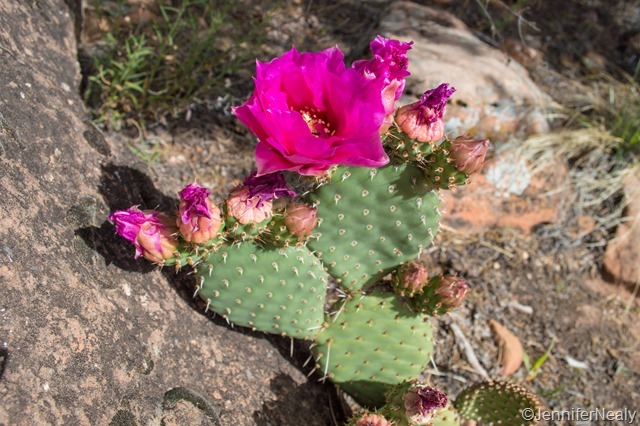 There is lots of hiking outside the park in the BLM land that Jake could have gone with you. Hope you did get to do a few trails. Yes, he is a VERY smart dog – which I’m sure is part of the problem! We didn’t do any hiking outside of the park – I guess I should have looked into that. We only had 4 nights there – we are trying so hard to slow down on this trip but yet I still feel like we’re rushing through some places! Your photos could be postcards they are so striking! It is a shame that you were not able to get more hikes in while in the area but you can always come back. It looks like a fabulous National Park. As for Jake, he does seem like he may be claustrophobic, if dogs fall victim to this condition. I am myself so know very well the feeling of being confined. Thank you so much! Of course, it’s easy to take beautiful photos when you’ve got beautiful scenery! I too have wondered if Jake’s issue might be claustrophobia – when he is inside he spends most of his time on the dash looking out the windshield. Who ever heard of a claustrophobic dog?! I can relate to the anxious dog issue. 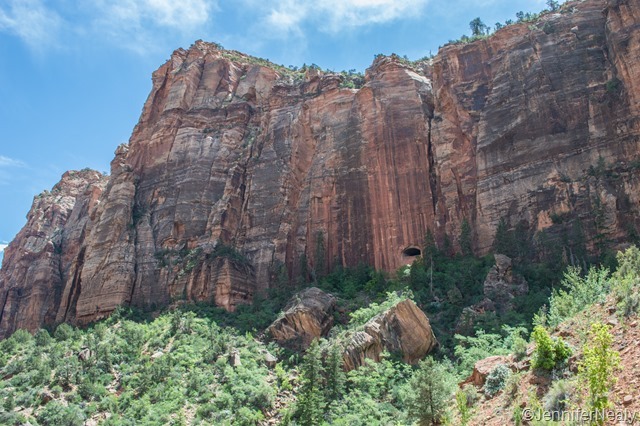 I was on the trail you mentioned with my dog this last Thursday and ate lunch in Springdale near the Zion entrance. My dog is an Australian Sheppard, 7 months old. I have been trying to socialize him and for the most part people are tolerable, but other dogs, not. We managed about a half a mile on the trail and called it a day. The drive though, was spectacular and I must have stopped 20 times before exiting on the east side. I have my fifth wheel parked outside the park because of the tunnel. I too didn’t think it was wise to tempt the tunnel and narrow roads. After seeing it I was glad I made that choice. Thanks for sharing your adventure, the pictures were awesome. Thank you! Jake is an Australian Shepherd mix – he’s fine with other dogs – he just doesn’t ever want to be inside! I agree the drive was beautiful – it was hard to narrow down all of my pictures to decide which ones to post! And good decision on leaving your rig outside the tunnel – I’m still amazed at how many people drive their rigs through it! 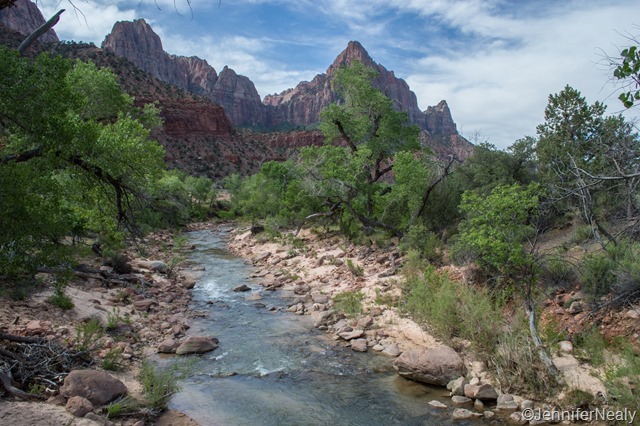 Great writeup and pictures of Zion NP. It is one of our favorites although we haven’t traveled there in our RV yet. We are now enjoying the cool weather on the Oregon Coast. Thank you! We love the Oregon coast – we spent several weeks there last summer exploring just about every inch of it. It’s a beautiful place! Oh poor Jake! I know that is frustrating for you and hope he settles down soon. We had a few of those same issues with our new pup on his second trip out in April. We had to stop for a quick overnight at a KOA on our way, and he never would go pee the entire time we were there and kept hopping all around the RV to check everything out for most of the trip. I hope yours gets used to his home away from home quickly! We did a 6-month trip in the RV last year – and we are 6 weeks into a trip this year – you’d think he’d be used to it by now! He just hates to be inside – I just can’t figure out why! As for the chipmunk pics, I was guilty of this myself last weekend. I don’t know about others, but sometimes it’s the only wildlife sighting I have and I like to keep practicing shooting animals, and sometimes the setting is just too beautiful to pass up! My recent shot was perfect light and a gorgeous spot. However, I feel the same way about people shooting deer and turkeys in Cades Cove at GSMNP. For goodness sakes, they stop the car and hang out the window like they just saw their first giraffe! Maybe it has to do with what is plentiful in your “home” area, southeast Wisconsin probably has more deer and turkeys than anywhere else on the planet I sometimes think! Mardi Gras was a blast! I hope it won’t be another 20+ years before I go again. Getting ready to do Mardi Gras with my family! It’s been YEARS since we’ve all been here together. And first Mardi Gras ever for the nieces.